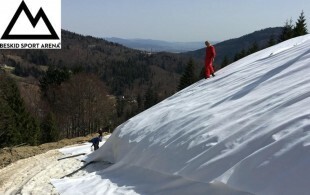 Operators are becoming less reliant on nature, thus it is becoming increasingly important to ensure that there is sufficient snow in place at the time when an event or race is to take place..
We have set ourselves the task of constructing a completely new insulation groundsheet that preserves glaciers, snow storages and other snowed surfaces, while retaining its whiteness and has the facility of being easily removed at the end of summer to be reused at a later stage. Evidently, there is a further advantage in the use of injection bars patented by Christian Steinbach that process the area to be covered in advance. The volume of snow developed is 750 kg/m³. Of course the cost speaks for itself, as it lies below glacier covers available on the market. The first snow depot in Polen and Middle- and East Europe was build in March 2016 on Skistation Beskid Sport Arean in Szczyrk with support of Steinbach Alpin. Both snow depots has a volume of 15.000 m³ snow. A successful story of snow-farming. Volume loss of both snow depots is round about 30%, but after blowing the snow we will get nearly 80% of the stored snow. Hochfilzen - a pioneer in terms of snow depots. Since many years we build snow depots to guarantee the biathlon competitions in the beginning of December.